About Sync is a free add-on for the Firefox web browser designed to reveal information about the Firefox Sync account and its data. Firefox Sync is the integrated data synchronization feature of the Firefox browser. You can use it to sync data such as browser bookmarks, the browsing history or passwords across connected devices. The add-on is designed for developers and advanced users as it provides an overwhelming amount of information when installed and run. It may however be useful to regular users as well, especially if they run into issues with Sync that they either want to investigate themselves, or assist someone else by providing advanced data to look at. 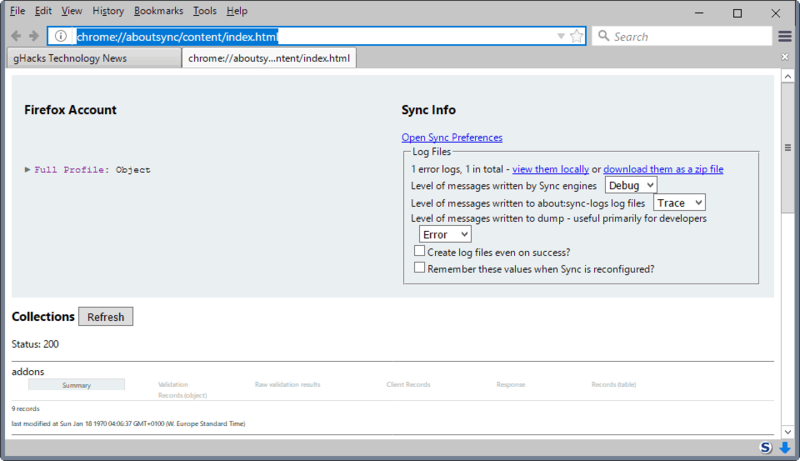 You can load the About Sync interface directly by loading chrome://aboutsync/content/index.html in Firefox’s address bar, or by selecting the option from the Tools menu. Since Firefox does not display its menu bar by default anymore, you need to tap on the Alt-key before the latter options becomes available. The interface is divided into several parts. The header area displays information about the loaded Sync account, and filters that define the level of details that the data is presented in. You find options at the bottom to load other data, either local Sync data or a JSON URL. The data is anonymized by default which is handy if you want to provide third-parties with it. The main part displays the Firefox Sync data. It is sorted into groups such as add-ons, passwords, prefs or bookmarks for easier access. Each entry lists various data fields for you to explore. You may look at client records or the records table for instance. If you do so for add-ons, you get information about add-ons installed on the client system. 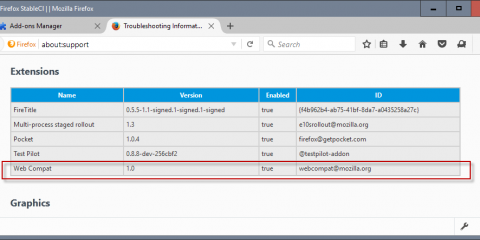 You may also open validation to find out whether there have been any issues validating the data, or browse raw validation data instead. About Sync is a specialized add-on for the Firefox web browser that the majority of Firefox users won’t have a need for probably. It can be useful to check the Sync data, for instance what gets synced, and also troubleshoot the synchronization process if it is not working as intended. Now You: Do you use Firefox Sync or a comparable sync solution? The post About Sync: Firefox Sync troubleshooting add-on appeared first on gHacks Technology News.